Takashi Akiyama (4th left) is joined by Japanese Consul General Akihiko Fujii (3rd left) and Dr. Pongdej Chaiyakul, Dean of the Faculty of Fine Arts CMU and organizers of the event at the grand opening. 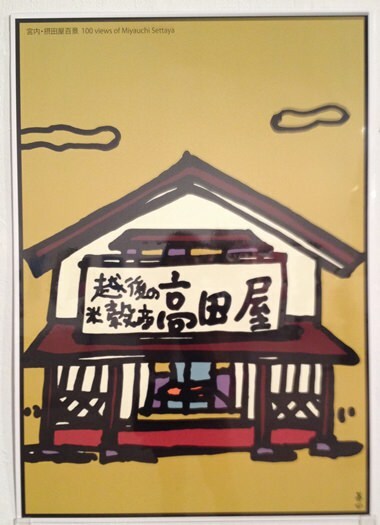 Japanese art and pop culture has seen tremendous popularity in Thailand and across Asia, the works of famed Japanese poster artist Takashi Akiyama opened at Chiang Mai University Art Center on Friday, September 12, 2014. Dr. Pongdej Chaiyakul, Dean of the Faculty of Fine Arts, CMU and Japanese Consul General Akihiko Fujii attended the grand opening of the exhibition which runs through September 28, 2014. Takashi Akiyama is a professor at Tama University where he teaches design; he is also the director of the Takashi Akiyama Poster Museum in Nagaoka, Japan. He is considered one of the top graphical illustrators in Japan and is known for his social commentary and humor in his poster art. This award winning artist has received accolades for his posters on ecology, AIDS and other important social issues. He has said that illustrations can fill in the gaps left by language, allowing everyone to understand the message. Professor Takashi Akiyama’s graphical posters have won awards including the Gold Prize in The Warsaw International Poster Biennial, 1986, Poland. The artist uses graphic illustrations to spread messages about ecology, AIDS and other social issues. This September, Traidhos Arts Residency Thailand will welcome renowned artist, Dr Sun Ock Lee, critically acclaimed professor, choreographer and dancer. Her pioneering Zen-Dance technique was founded in New York City in 1972 and has been performed by international dance troupes all over the world. Lee will be teaching, performing and conducting workshops during her residency. For over thirty years, the acclaimed Korean dancer and choreographer has been teaching and performing throughout Europe, USA and Asia. Dr Lee is renowned in her native Korea and the United States for her extraordinary dance form based on the mastery of the mind/body techniques of Korean Sun Mu – Zen Dance. Inspired by and developed for well-being in our contemporary environment, it is a hybrid of Zen and dance meant for public performance, daily practice, and clinical therapy. Her technique and therapy have been received with international recognition at holistic centres and New Age institutes around the world and have been used for programmes focused on breast and womb cancer, spinal disc management, pre-and post-natal conditions and stress reduction for people of all ages and occupations. Dr Lee will be in residence at Traidhos Three-Generation Community for Learning from 28 September - 7 October 2014. For more information about Dr Lee’s residency, or about Artist Residency Thailand’s wider programme, please contact Alex Soulsby at [email protected] threegeneration.org or go to www.artistresidencythailand.com.